Lost City of extinct civilizations holds many secrets. Discover the destiny of the ancient gaming board! Magic marbles will disappear only when you place them in a row! Demonstrate an opened mind and speed – defeat the power of the Aztec priests! 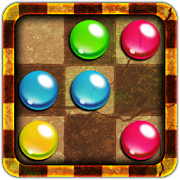 Magic Marbles is a simple game where you have to place at least 4 marbles next to each other (in a row or column).